I love social media almost as much as I love blueberry pancakes. While scrolling through my Facebook news feed recently, I saw a friend who was making blueberry pancakes and reading her little one’s Curious George Makes Pancakes. Immediately, I ordered the book on Amazon to read the next time I was making a batch of delicious blueberry pancakes. This blueberry pancake and book duo could not be a better combination. I’m always looking for new and exciting ways to incorporate story time with our meals. One of my all time favorites was when I made Tacos that were served in my children’s Taco Trucks and read the story Dragon’s Love Tacos. Now my kids love taco night for more than just the obvious reason, tacos are awesome! You know why I love social media so much… because of the quick access it gives us to sharing tips, tricks and everything food right at our finger tips. This is my simple tip I’m sharing to turn your boxed pancakes into The Best Blueberry Pancakes. Prepare the mix according to the packaging, (I love Trader Joe’s Buttermilk Pancake Waffle Mix) adding to the batter vanilla extract, cinnamon and of course blueberries. 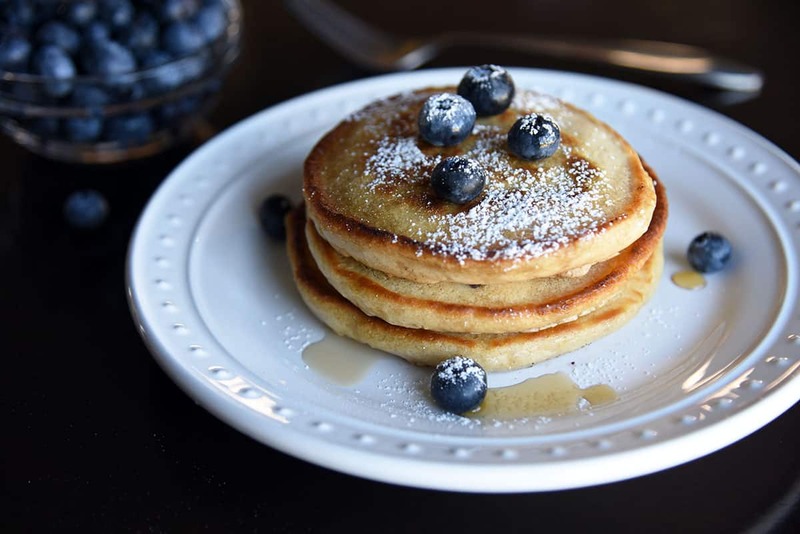 By adding these delectable ingredients you take simple blueberry pancakes and flavor them to perfection making them The Best Blueberry Pancakes. Gather your Favorite pancake mix, some blueberries (scratch that lots of blueberries), vanilla, cinnamon and make The Best Blueberry Pancakes today!